LivItaly’s Day Trip to Naples and Pompeii from Rome is one of the best ways to spend a day out of the city. Meet your private chaperone at central Rome Termini Train Station. Sit back in business class and enjoy a high-speed ride to the center of Naples, getting there in just over an hour. Travel on a local train past Mount Vesuvius to the Pompeii ruins, and meet your private Pompeii guide for a tour of this fascinating site. Journey back to Naples by train, and explore some of its city by foot, admiring sites like The Royal Palace along the way. 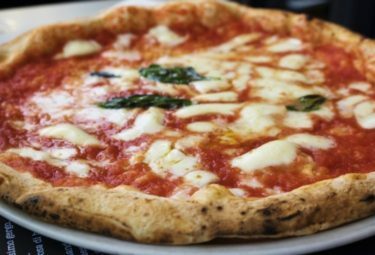 Stop for an authentic Neapolitan pizza, and then enjoy a coastal stroll with wonderful views as the perfect end to your time in Naples. Take the high-speed train back, arriving in Rome in the early evening. A special day out down South, with a private chaperone alongside to make it stress-free and all fun – all this in just one day! 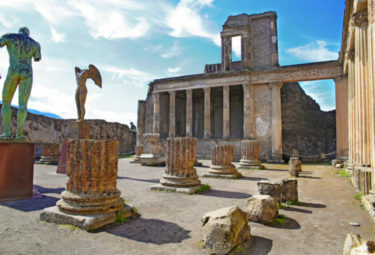 WHY BOOK LIVITALY’S DAY TRIP TO NAPLES AND POMPEII PRIVATE TOUR? 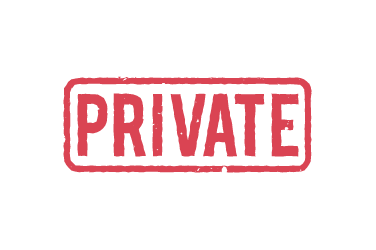 On a private day trip, you have a private chaperone for the full day, making the trip stress-free and all fun. 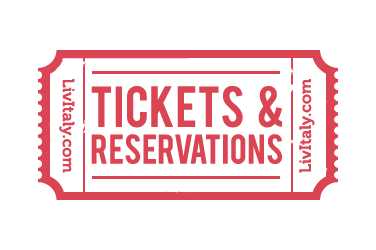 With everything organized for you, you can simply enjoy every moment of your trip down South, without having to worry about anything. 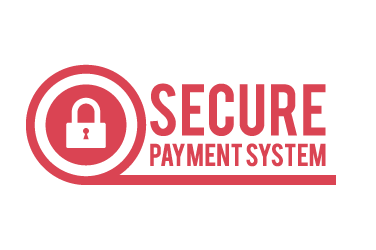 You will also get to avoid traffic by enjoying a high speed train trip with a chaperone guiding you through every step of the way. 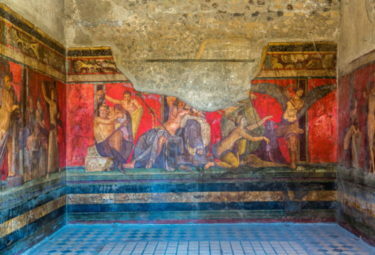 You can also expect a private tour of Pompeii with your very own expert guide, offering a more personalized experience. Private tours are a great way to see the sights at your own pace. Start your private day trip at Rome’s central Termini Train Station, where you will meet your private LivItaly chaperone. 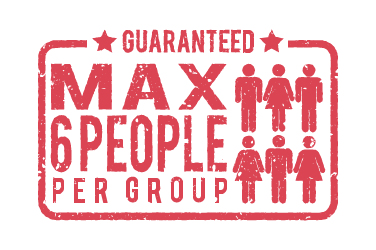 Your private chaperone will be with you for the full day, as your personal local travel companion, organizing everything and making your trip smooth so you do not have to worry about a thing. 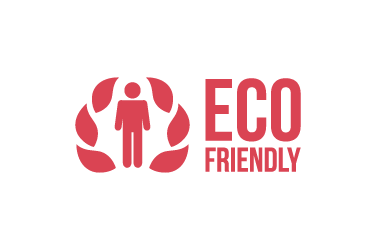 You will get on a high-speed Frecciarossa train and make your way to Naples, sitting back in the comfort of business class, with snacks and wi-fi provided along the way. 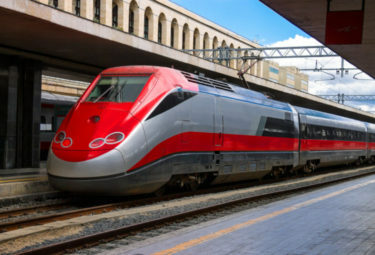 This high-speed train travels up to 185 miles/hr, so you will be arriving in Naples Central Station in just over an hour! 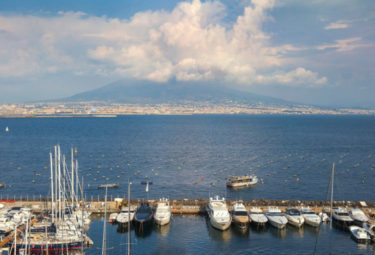 Once you arrive in Naples, your chaperone will accompany you on a local train on the Circumvesuviana to the famous Pompeii ruins, with Mount Vesuvius getting closer and closer. Arrive at the Pompeii station, and make your way to the ancient site to meet LivItaly’s local Pompeii guide. 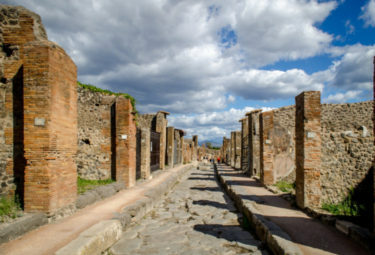 Now, at the ruins, right at the foot of the giant volcano that once destroyed it, you will begin your private Pompeii tour with special skip-the-line access. Start your journey through this incredible ancient city, weaving through its ruins with an archaeologist guide by our side, visiting different parts of the city like the Pompeii Forum, Houses and Baths. Marvel at the many still-standing structures, mosaics and frescoes, remaining here even after it was buried in 4-6 meters of ash and rock after the eruption. Enjoy having a private guide bring this ancient Roman city back to life with interesting stories of its past. After your private Pompeii tour, travel by train back into Naples and stroll through the city center with your private chaperone alongside. Admire the opposing beauty of this spirited city, walking down old narrow streets with graffiti-walls, washing lines out, and locals bustling about, and then find yourself amongst embellished architecture and impressive buildings like The Royal Palace. 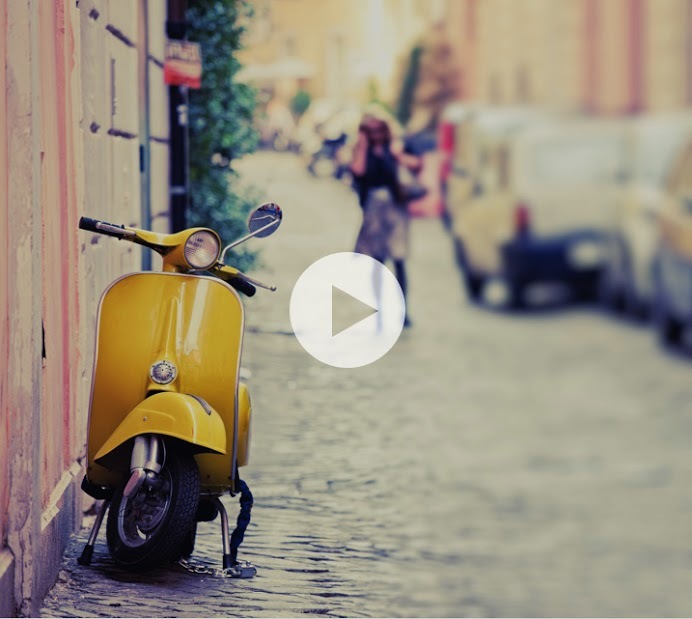 Enjoy discovering one of the South’s most spirited cities, Napoli! This is of course the birthplace of pizza, and so, your next stop will be for a juicy Neapolitan pizza at a local spot. Savor every last bite, before making your way to the promenade for a leisurely stroll along the coast with wonderful views. Time to get those cameras ready! In Naples, there is a fantastic pedestrianized seafront strip that runs for about 1.5 miles along its coast, with many glorious sites to see along the way. Out to sea you can see wonderful views of the bay of Naples, The Island of Capri and Mount Vesuvius in the near distance. Along the path are also two lovely waterfront castles, parks, villas, restaurants and bars. The views are expansive and inspire lots of photo taking. You just can’t help it, as it is just so refreshing and beautiful! This coastal stroll is particularly pleasant at dusk, with seaside views taking on glorious rich sunset hues. Many locals delight in this coastal stretch at the close of day, enjoying the fresh sea air and its wonderful surroundings. As the city of Naples is well-known for its lively hustle and bustle, the calm of this seaside strip offers a refreshing way to uncover another side of this sprightly seaside city. After your seaside stroll, with your chaperone, get a pre-arranged taxi back to Naples Central Station and get on a high-speed train back to Rome, arriving back in the early evening. You will have done a lot in one day, visiting ancient ruins, exploring a spirited southern city and enjoying the original pizza in the place where it was invented. You will have many memories to cherish and will have a new appreciation for the treasures of the south! Hop onto the fast train from Rome with a chaperone who will be with you all day. 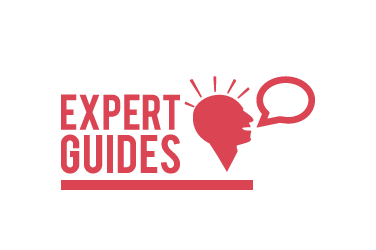 Head directly to the ruins of Pompeii where you'll meet our expert guide. 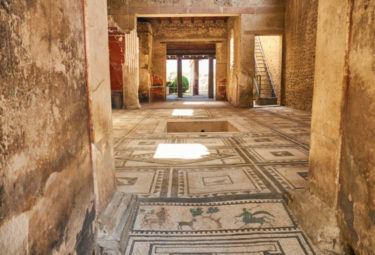 Walk through Pompeii while listening to stories about the history of this city. Fall in love with the magnificent artwork and sculptures that are still intact today. 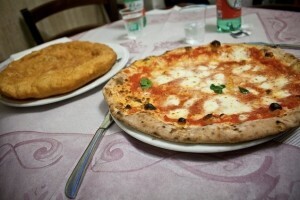 Once you've built up an apatite, head to Naples to enjoy a traditional Neapolitan pizza. Explore the gulf of Naples boardwalk while enjoying the beautiful views of Mt Vesuvius.